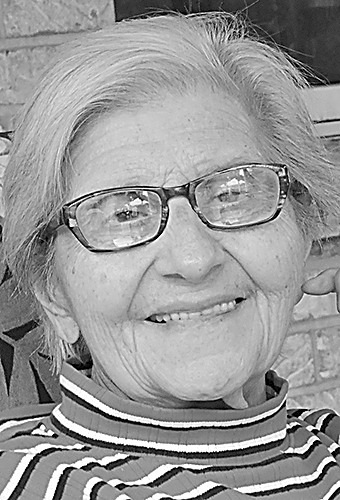 Angelina Glyptis, 92, died peacefully Tuesday, February 5, 2019 in Grace Cottage, Weirton, WV. Her loving family was at her side. A daughter of the late Theodore and Kalliope Melis, Angelina was born on July 5, 1926 in Weirton, WV. In addition to her parents, she was preceded in death by her husband Gus P. Glyptis on August 2, 1975, brothers John and George Svokas and sister Anna (Rangos) Rizakus. Angelina was a loving wife, caring mother and Yiayia. After her husband’s death in 1975, she worked for Hancock County Schools, where she was a food server for over 20 years. She was a member of the All Saints Greek Orthodox Church where she was an active member of the All Saints Ladies Philoptochos Society, and was instrumental in forming the Camp Fire Girls program at the church. Most of all, Angelina will be remembered for her warm smile, compassionate heart and her love she had for her family and church. Angelina will be remembered with love by her three sons, Pete (Marlene) Glyptis of Pittsburgh, PA, Ted (Lamone) Glyptis of Weirton and Mark (Jane) Glyptis of Oakdale, PA; her grandchildren, Stephanie (David) Wasieleski, Christina (Dennis) Morton, Gus and Valerie Glyptis, Phillip and Stephanie Glyptis, Angela and Jake Myers and Elizabeth Glyptis; her eight great-grandchildren, Joshua, Andrew, Anthony, Betty, Teddy, Abigail, Giuliana and Aria and many nieces, nephews and great-nieces and nephews. Visitation will be Friday 2-8 p.m. at the Greco-Hertnick Funeral Home, 3219 Main Street, Weirton, WV. Additional visitation will be held Saturday from 10 until the 11 a.m. funeral service at All Saints Greek Orthodox Church. Rev. Father Frank A. Milanese will officiate. Interment will follow in Paris Cemetery, Paris, PA.
Memorial contributions may be made to All Saints Greek Orthodox Church, 3528 West Street, Weirton, WV 26062. Angelina’s family would like to thank the wonderful staff of Grace Cottage for all the care and love they provided while she was a resident in their care. Share tributes and memories at www.grecohertnick.com,	304-748-3219.